BELLIN -Carte des Isles de Maiorque Minorque et Yvice. BELLIN, J.N. - Carte des Isles de Maiorque Minorque et Yvice. Carte des Isles de Maiorque Minorque et Yvice. - BELLIN, J.N. Title : Carte des Isles de Maiorque Minorque et Yvice.. Size : 16.0 x 22.2 inches. / 40.7 x 56.5 cm. 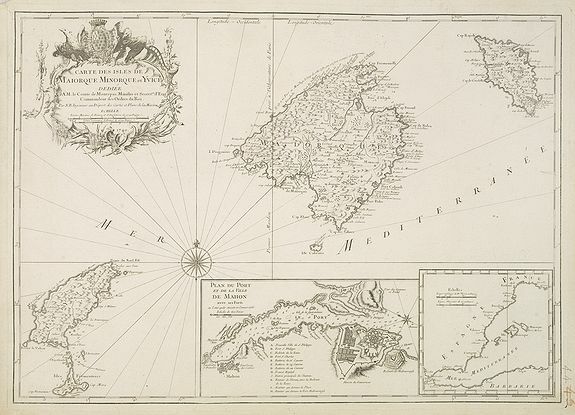 Description :Uncommon map of Majorca, Minorca and Ibiza prepared by J.N. Bellin. With an inset plan of the harbor of Mahon "Plan du Port et de la Ville de Mahon", .and a second inset of the western part of the Mediterranean showing the location of the Balearics. Condition : Printed on heavy paper.